Beach cottage right on the lake with stunning views across the lake. Situated right on the lake, this charming beach house has everything on its doorstep. Throw a line in from the front lawn, pull your boat up to the adjoining little beach, dive into the lake or simply relax on the front lawn and read a book. Surrounded by National Park, this little piece of paradise is home to many friendly bird species, kangaroo's and marine life. Enjoy views of the lake from the kitchen, lounge room and all bedrooms. Cook up a storm in the well equipped kitchen or fire up the BBQ on the front lawn while watching the sunset over the lake. This place is truly magical. Only 2kms to Conjola Beach and Green Island. The historical town of Milton is only a 10 min drive from the Lakehouse where you'll find great shopping and cafes. THE LAKEHOUSE SLEEPS A MAXIMUM OF 6 GUESTS INCLUDING CHILDREN - Please not that failure to comply with this will result in loss of RDD/bond. Master bedroom with plush pillow top King size bed. Other bedrooms each contain 2 single 'ultra plush' pillow top beds. Well equipped kitchen with gas cooktop. Open plan dining/living room with comfy sofa and awesome views. Visit Milton and its fabulous cafes', restaurants, art galleries and antique shops. Lake Conjola is a tidal lake opening from Conjola Beach. Conjola Beach is only 5mins drive in the car or a 20min walk from the house. Overlooks the lake and Conjola National Park. Gorgeous sunrises and beautiful sunsets abound. 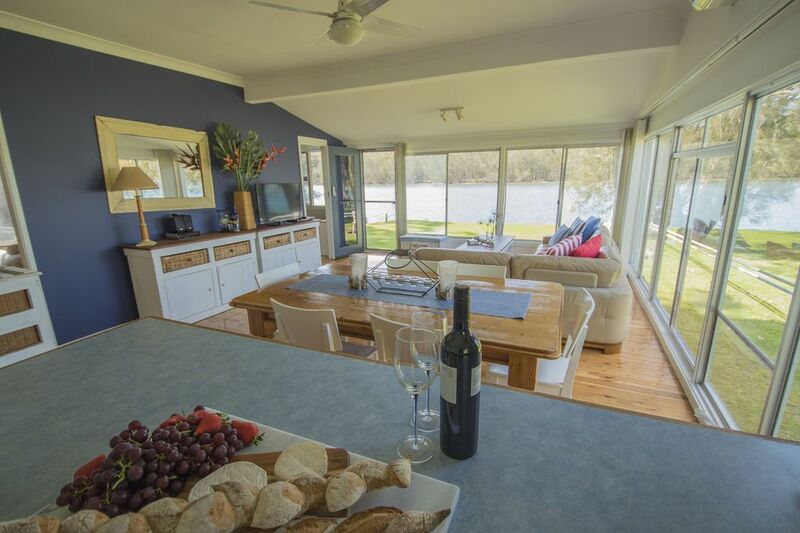 The Lakehouse has stunning views of the Lake from the Kitchen, Living room, Dining room and all bedrooms. Enjoy a BBQ on the front lawn overlooking the ever changing lake. Surrounded by National park. It doesn't get much closer to waterfront than this! Throw your fishing line in from the front lawn and enjoy the serenity of it all. Unlimited WIFI is available at the house. Open plan Living room has lovely comfy sofa, TV and great views of the lake. Large 4 piece toaster along with a sandwich press. The basics are there - olive oil, salt, pepper, chilli flakes, vinegar, glad wrap, foil and baking paper. Open plan dining room with views of the Lake. There's a Telstra TV connected to the TV which you can us if you have your own Netflix, Stan or Foxtel account. Hundreds of DVD's to choose from. A small selection of books and National Geographic magazines. There's a few board games for everyone to enjoy along with coloured pencils and paper. Thank you Karen for our lovely weekend stay in your house. The moment you open the front door and see the views of the water you are instantly in relaxed mode. Decor very tastefully done and no shortage of anything. All very clean and tidy! We love fishing and had the water right at the back door. Can't get much better! If you love your wildlife, as you sit outside in the afternoon watching the sun go down, the friendly kangaroos, birds, ducks join you. Pretty special! We have no hesitation in recommending this sweet house to anyone and can't wait to return ourselves. Cheers and thanks for the lovely bottle of red wine and chocolates. Lovely touch! We had a wonderful stay , the serenity is so peaceful the abundance of wildlife and the character of the house made it such a memorable holiday we hope to be back again! Thank you for sharing your little lake house with us! Amazing location. Beautiful, warm and welcoming house. Can’t wait to stay again. Incredible location. Love how warm and welcoming the house was. Felt at home straight away. Everything you could possibly want for a lovely weekend away: waterfront views, board games, dvds, beds so comfortable it was hard to get out and only minutes away from the beautiful beach. Great house, great location, great experience. Worth every cent. We will be back. From the start when booking until we checked out things couldn’t have been easier. Karen and Rod have a great house that we were privileged to share. The little things they have thought of - a welcome present, a box of things we may have missed packing - on top of what comes with the house as a matter of course, are all outstanding. The house itself is beautifully presented and makes you feel at home as soon as you walk in the door. As for the location, none better. We could relax when we needed and get to places if we wanted. All with the amazing view of the lake. We love the area and we know live this house. We will be back. Thank you Roy. We're so glad you enjoyed your stay and appreciated all the little touches to make the Lakehouse seem like your 'home away from home'. We'd love the opportunity to welcome you back sometime. Until then, take care and many thanks for taking the time to share your experience at the Lakehouse. Had a great boys weekend down here with fishing and wakeboarding in the lake and great surf breaks near by. An awesome weekend away!! A beautiful coastal waterway, Lake Conjola is perfect for aquatic adventures. Enjoy a range of water sports, including fishing, kayaking, waterskiing and wakeboarding. Cyclists will be thrilled with the exhilarating trails weaving through Conjola National Park on the northern side of this deep lake. Surfers will be impressed with long rides at Green Island, at the mouth of the lake and just below Cunjurong Point. On the southern side of the lake is the village named after the sparkling waterway. Boats, kayaks and stand-up paddleboards are available for hire from Lake Conjola Post Office Store.